I think I like this before shot better than my staged photo. It was too sunny outside. Crazy that’s a consideration again. Go Spring! I’ve been thinking a lot about photo shoots and locations. I’m feeling stumped. Like there are just no cool locations here in suburbia to take photos. But that can’t be true. I think I need to dig deeper. Put some dolls in the car and just be prepared to slam on the brakes if I see anything remotely interesting. I definitely prefer the ‘before’ photo – the ‘after’ looks a little sinister! I know the feeling about not having anywhere to photograph things – I’m so looking forward to moving in a couple of weeks and at least having a garden to use! Anyway, the dresses are lovely! On either pics. The massed effect of them in the photo above is great, but it’s also nice to see them in their full glory in the tree! 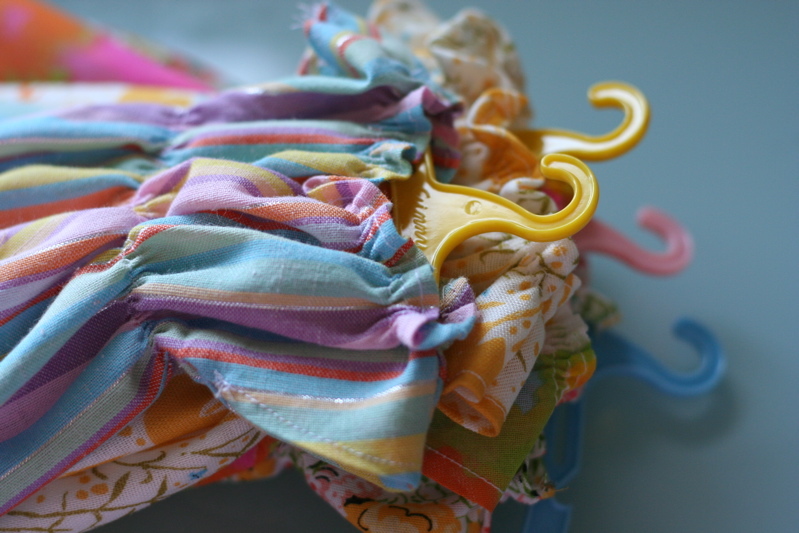 I like seeing the light play on the little hangers and the texture of the fabrics in the before photo. Also the varying depth of focus is quite interesting. 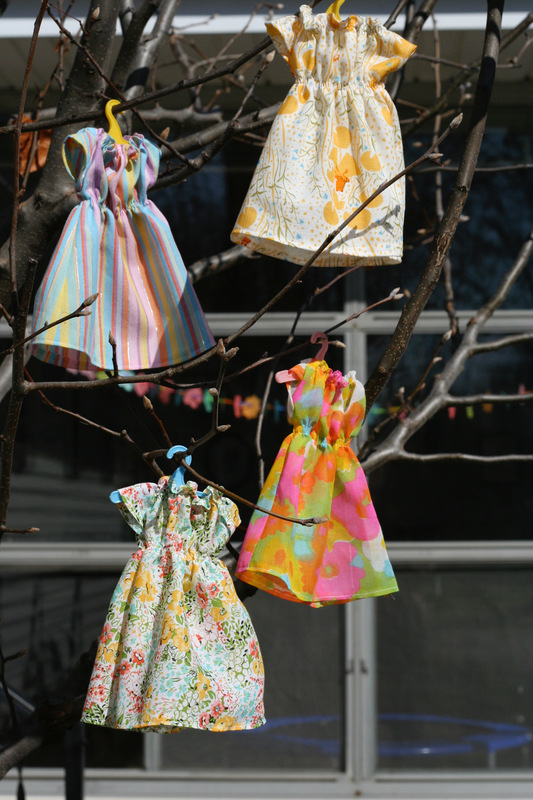 How about a the dresses hanging from a doll sized clothes line….with wee clothes pins? Yes, adventures make for the best photo-shoots! I’m stuck with the same problem myself. I usually wind up taking pictures in my parents’ backyard (neighbors totally used to seeing either myself or my dad playing with cameras) but right now things are a bit bare and the pond really needs cleaning out… I see so many lovely pics on Flickr I’m going to make a list of possible photo hot spots. I think the idea of packing up the car and heading out for a fun spot to shoot pics sounds cool. Also — I’ve always like those doll dresses you have framed — perhaps you could do something like that where you could easily switch out the subject (and possibly the background).